Oh No! Something’s Wrong with Healthcare.gov! 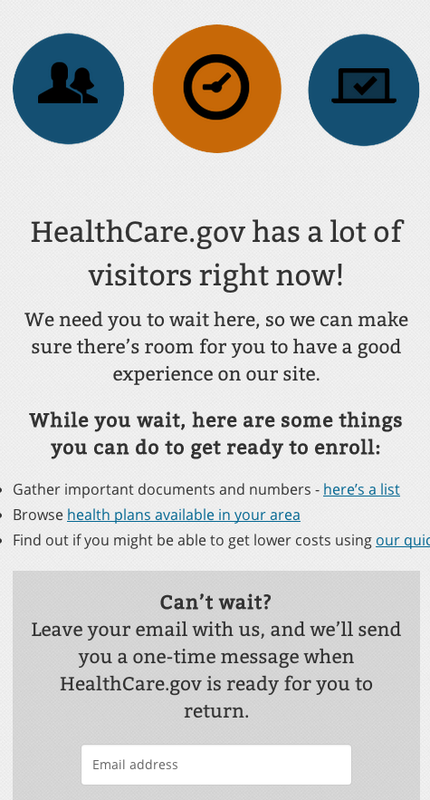 I just tried Healthcare.gov. Look what happened. Something’s wrong! Who would have expected this? It really hurts not to be part of the vast majority. David Martosko over at MailOnline decided to enter an email address. Here’s what he got. Hmm, I guess you have to wait to skip the wait. But then again, please learn to be patient. Lines are common in Socialist countries. 40 Responses to Oh No! Something’s Wrong with Healthcare.gov! Can’t wait–leave your email? That’s waiting!! They have lost control of the English language completely–it finally happened. Oh, just go bare, pay the fine, have a vacay on the money you save, pray a lot, eat citrus, and hope Amazon will start selling this stuff–they can even “drone” the scrips to your door. Leave your email. We will forward it to the IRS. Only after we share it with Organizing for America, the DNC, and the White House Office of New Media… only to be held in the strictest confidence, of course. Don’t forget the Acorn lady’s boyfriend. And NSA and the Chinese government. Seriously? This is customer service? They’ll send an email when the “site is ready,” and what? You are supposed to respond in the next 5 milliseconds before it gets occupied again? And of course, Obama stands up and claims it’s all fixed. March 2014 – still waiting for that email.. Oh dear, now you have to pay a fine b/c you are not enrolled. A real Catch 22 situation. If “ObamaCare/ACA” is SO AWESOME!!! Why is everyone in that cesspool of DC politics EXEMPT from “ObamaCare”…??? Kathleen Sibelius recommends that you try in the wee hours of the morning. Here’s a news flash. The Atty Gen of Oklahoma actually read this thing and learned that the IRS can only assess penalties and give subsidies to people who get their ins through a STATE exchange–not the federal. Lawsuits are pending. If this is sustained, only those in 14 states can be fined or helped. The rest can just sit there. The skinny is in today’s WSJ op-eds. If word of this gets out, a lot of young people will not join Obamacare. Also, there are more people who will be terminated in mid-2014. By interrogating my insurance broker, I found out that my health plan, due for renewal as of April 1, will not be renewed because I am a small business. So now I have to find another insurance plan. The broker could not tell me what is available because (1) no one knows if my insurer will be permitted to extend the policy and (2) the insurers have not figured out how to price any new policies. Hopefully, they will figure it out by April 1. April 1 – how appropriate. April Fools Day! Except the joke is on US. Wee hours? No problem–you will be lying awake anyhow wondering what the patoot you are going to do. Are they serving free coffee and donuts while you wait? Sure–they come squooshing out your dvd drive. actually the dvd holder that pops out is for you to set your coffee cup on..
Get in line, Keith. They’ll be ready for you as soon as you exit the showers. That is how most Democrat/Liberal/Progressive “Obama supporters & sycophants” want to treat We “conservatives/Patriots/anti-Obama types”. Sorry I can’t leave the house today as I am awaiting a one time message from healthdebacle.gov! Geez at least the cableguy can give you a time window. I don’t dare go near that website for fear of it sucking on my cookies history and bank acct info. No thanks. Yeah, it made me hungry too :D But not as hungry as OFA. You’re a brave soul, Keith. I wouldn’t go anywhere near that website if my life depended on it. My motto is to resist tyranny at all costs. I’ve tried the website several times just for giggles and tickles. I would never sign up for real or give my real personal information. The website looks like it was designed by an eighth grade nerd. Blocks of type are superimposed on each other, and when I go onto the “what would it cost you in your state/county” page, the numbers are half hidden. What a mess. Oct.1st pushed to November 1st pushed to December 1st … I sense a pattern like the one being used by Iran. thank goodness no red lines..
Hmm. I wrote a long OT post on foreign policy and made a gentle friendly comment to Keith because the site said I was posting too quickly. I waited and then hit submit and assumed all was well. Apparently not. The post has gone somewhere but not here. Oh well. The point. Here is a very good article by Walter Mead about the changes in the international balance of power. And by extension the result of Obama’s policy of appeasement and stripping the US of any international power. It’s long but worthwhile. And here is my tin foil theory of Obama’s destruction of America. Dems elect Clinton or Warren and the path to socialist centrally planned command economy in America complete. The socialists appoint a US Ambassador to UN. Obama becomes GS of UN. US acts in concert with Iran, Russia and China. Now he can really go to town. Oh yeah, the girls can stay in WDC to complete schooling, Mooch can party hearty and the UN Grifter in Chief can fly about the world in grand style pontificating and speechifying to his heart’s content. …or you can wait until “off-peak” hours, as Katie suggests. That would be between 11:50 PM and 12:01 AM. My rage at the administration’s naked propagandizing is exceeded only by my dismay at the media’s collective yawn at same. “First, they came for the communist, but I was not a communist….” Martin Niemueller. I wonder if it’d be illegal to leave phony but funny e-mail addresses. I think you mean IP address. I will not venture anywhere near this website because of “zero” security of the site. Hmmm… looks more and more like one of those Nigerian banker schemes to me.